Involved with the team since December 2014 Jeremy Holt and Will Thomas reveal how team identity contributed to this success. The 3-3 full-time score does not tell the story of the match; for much of the final the Netherlands were camped in the GB half making 17 shots on goal to GB’s 7. As Netherlands coach Alyson Annan said her team “dominated the whole game”, adding: “Tactically, we were strong. Technically, we were strong. Physically, mentally, we were the better team. That makes it much more disappointing.” The Netherlands, the world’s number one team, won gold at the two previous Olympics, are the reigning world champions and, despite losing to England in the European championships, expected to win. What gave the GB women the resilience to come from behind twice, equalise with only 6 minutes of the game remaining and then to dominate the penalty shoot-out winning it 2-0 for gold? Like other great teams, the strong distinctive identity of the women’s hockey team affects everything it does – the way it trains, how people behave with each other, its warmth, the passion, how it handles disruptive behaviour, conflicts, adversity and how it integrates new team members. Team members have fallen in love with the team – not the individuals, but the concept of the team. Being a member of the team connects them to a bigger purpose, gives them a sense of belonging, competence, continuity and self-esteem. Most importantly the backbone of these clear strong shared beliefs is an agreement about what it would take to win gold. Our research with the University of Sussex has shown that members of winning teams hold characteristic beliefs that make the team emotionally attractive. This attraction leads them to integrate the team into their sense of self – the team literally becomes part of who they are, their identity – and motivates them to put the team above themselves. Team identity is not an abstract concept; it is a lived experience. From our findings we have developed TRIBE, a model that enables us to help teams find their strengths and vulnerabilities and take practical steps to become great. Although they were already doing well, the hockey women used TRIBE to fine tune their identity and team dynamics. There is also a growing research base that suggests a strong sense of belonging is a major contributor to resilience and identity1. People with strong group memberships are protected against depression, or its recurrence and cope better with trauma, stress and anxiety2. Belonging is also one of the factors we measured in our research – it is the B in our model TRIBE. When we first measured belonging in the GB team it was the strongest we had come across, and the team took further steps to strengthen and deepen it. After the final, as players reflected on their success, the recurrent theme was the strength they had as a team and their deep sense that they belonged. As captain Kate Richardson-Walsh said to the BBC “Hockey has given me confidence. A space in the world where I feel comfortable and I belong. This is me. This is who I am.” Click here to see the interview. 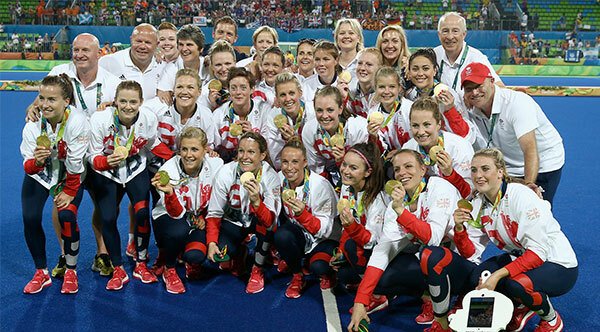 The GB hockey women first took part in our research in December 2014. Over the ensuing months we monitored the performance and identity. They had more of the beliefs and attitudes that we hypothesised would drive success than any other team in the research and we told them so. But like most successful people they weren’t satisfied and so Danny Kerry and the team’s sports psychologist Andrea Furst asked us if we would support the team directly, giving them feedback and proposing actions they could take to get even better. Of course we said yes. From May 2015 until May 2016 we supported the team, coaches and sports psychologist at Bisham to find ways for them to become an even stronger team. Although we had worked extensively with teams in business and the military we were unproven in the sports arena; many teams would have been put off but to Danny and Andrea this was an asset, something they could do that no one else was doing. Curiosity, humility and courage are often behind winning performances. The margins between victory and defeat are often small in sport, the military and business. Winning teams invest the time to make sure they have every psychological advantage they can muster. Sometimes the conditions are right by good fortune – the happy coincidence of a leader’s will and a team ready to follow. But if you don’t want to leave things to chance get in touch with us and find out about TRIBE.